Xûr is located in the Tower’s Hangar by Dead Orbit. For the duration of Season 4 Trials of the Nine and Faction Rallies will not be active. 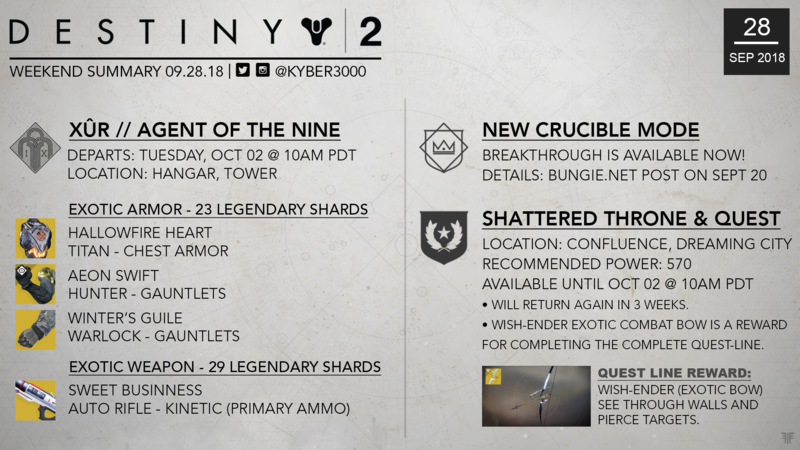 Get more activity details and read some of the most recent Destiny 2 news below. Note: For Destiny 2 Forsaken guides click here to visit the new page currently being made. New guides and helpful info from members in the community will be periodically added to this new page. If you hack the enemy team’s Vault, you win the round. If you fail to hack the enemy team’s Vault within the round time limit, you lose. If you are in the process of hacking the enemy team’s Vault when time runs out, you will enter Sudden Death until you either hack the Vault, or the enemy removes all your progress. First team to win three rounds takes the match. For those who have yet to play since Iron Banner went live, Convergence will also be available as a Breakthrough map. Players on PlayStation 4 will also have access to the map Gambler’s Ruin. Ever since Forsaken launched, we have received tons of feedback on a wide variety of topics. Two issues seem to stand above the rest: the cost of Masterwork Cores and the drop rate of Exotic weapons and armor. We asked the investment team to talk about some of our goals with Masterwork Cores and Exotic drop rates, the problems we’ve identified, and our plans for addressing them. Investment Team: We have been monitoring the community’s feedback concerning Masterwork Cores and Exotic drop rates. Here is a quick breakdown of our original design goals along with some of our plans to address your feedback. We’ll continue to monitor your feedback and will give you more details about these changes before they go live. This week in Destiny 2, Forsaken players began their pursuit of Malfeasance. As players started making their way through the quest for this Exotic Hand Cannon, it was discovered that the three-player quest step “Darkness in the Light” could be launched with a fireteam of up to six players. While we are working to address this issue in a future hotfix, we urge caution to fireteams who launch into this activity with more than three players, as it was designed and tested for three-player fireteams. Players who launch into this activity with four or more players may encounter memory issues, which may result in poor game performance or unexpected client crashes. Stay tuned for updates. Today, Bungie.net underwent website maintenance. During this maintenance, API authentication was disabled, and thus some API services were not available for use across Bungie.net, the official Destiny Companion, and third-party applications. Now that this maintenance has concluded, players who encounter issues with Bungie.net and API services are encouraged to report them to the #Help forum. WANTED: Gravetide Summoner Bounty: We are investigating an issue where some players in a fireteam don’t receive credit for killing the Gravetide Summoner and then can’t replay the adventure. It is recommended that players play this Adventure solo to receive proper credit. Prime Engrams from the Crucible: We are investigating an issue where Prime Engrams earned by completing Crucible matches are going straight to the Postmaster without first going to players’ loot stream. Gambit Clan Engrams: We are investigating an issue where the clan engram for Gambit is not being awarded as expected. Wish-Ender Exit Damage: We are investigating an issue where Wish-Ender’s Broadhead perk may sometimes not apply exit damage on fast-moving enemies. 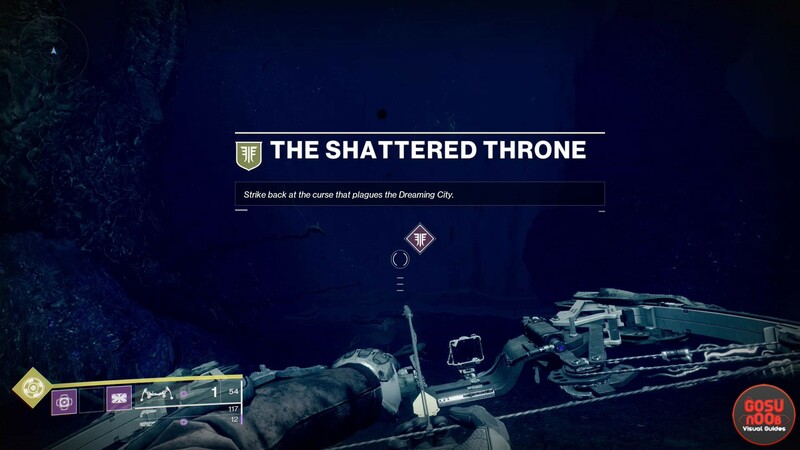 Oathkeeper Draw Speed: We are investigating an issue where bow-draw speed benefits granted by the Oathkeeper Exotic Hunter arms armor are not performing as expected. Damage, Incorporated Emblem: We are investigating an issue with the Damage, Incorporated emblem not appearing in Collections. Players who delete the emblem will not be able to reclaim it. Dismantling Gambit Weapons: We are investigating an issue where some Gambit weapons do not give materials when dismantled. GUITAR Errors in the “Last Wish” Raid: We are monitoring reports of GUITAR errors received by players participating in the “Last Wish” raid. Destiny 2 // QUEENS COURT FOUND! Meet Mara Sov, 3rd Seed Of Light & More! For Forsaken guides click here. Have a great weekend!